For the occasions when you need an extra presence, Ace goes ahead of and with you clearing and shielding your way; protecting and strengthening you and the message you project. 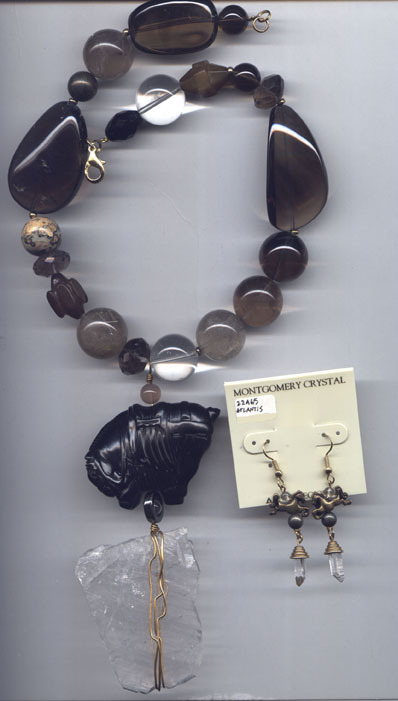 Absolutely one of kind Arkansas tabular rock crystal with premium rock crystal, rock crystal with golden rutile, facetted and freeform smoky quartz, facetted antique Soochow jade, leopardskin jasper, peach moonstone, pyrite and hematite beads. 18k goldplate and jewelers' brass, lobsterclaw clasp, approx. 17" with pendant to 5-1/2". Shown with Atlantis earrings on French wires - perfectly matched Arkansas rock crystal laser points, with tiny rock crystal, pyrite and prancing horse beads. Made to order, please inquire.